Mike Newell directs Love in the Time of Cholera, an epic love story set in Columbia, about Fiorentino (Javier Bardem), a man whose soulmate, Fermina (Giovanna Mezzogiorno), rejects him during his youth. He waits decades to rekindle his broken heart with her despite that she's married to Dr. Juvenal Urbino (Benjamin Bratt). Based on the Spanish novel by Gabriel García Márquez. Mike Newell has previously directed Harry Potter and the Goblet of Fire, Mona Lisa Smile, Donnie Brasco, and Four Weddings and a Funeral. I had the privilege to interview him. New Line Cinema releases Love in the Time of Cholera on November 16th, 2007. NYC MOVIE GURU: What was it like shooting in the city of Cartagena, Columbia? MN: There’s a personality to the city and a very particular cast to the people. It’s one of those cities that’s a repository of Caribbean history for the last five or six hundred years because it was the great slave market, where slavery actually began. The whole city is in the movie. There are people who you would see in the stores playing considerable roles in the film. There was this tremendous sense that they had of authenticity and that they would help us with it as much at they could. We went back to Cartagena all the time as a kind of reality check. The composer went there and got the local musicians to play for him and took them down to Brazil to make the music. NYC MOVIE GURU: In what fashion was Gabriel García Márquez an asset in the writing process? MN: One of the key documents was a set of note that he wrote after he had read the first draft [of the screenplay]. He was very complimentary about [it], but, at the same time, he’s stubborn. He said, “Fine, but where’s my stitch-work?” I couldn’t make out what the stitch-work meant until I read that the way the novel is constructed, he takes an incident and, sometimes immediately afterwards, he would write it again from another point of view. The stitch-work is the folding of one view of a character on top of another. The same would be true of key pieces of action. NYC MOVIE GURU: How did you choose the main cast? MN: Our money was coming from American sources and an audience will pay to go to a movie if it feels that it’s in safe hands. The more we thought about it, the less we believed the high road, the old Hollywood road. As soon as you depart from the top six names [of actors], then getting your money back would more problematic. [However], we would get a better cast if what we did was simply to chase the very best actors around the world. So, we got this wonderful, colossal cast. 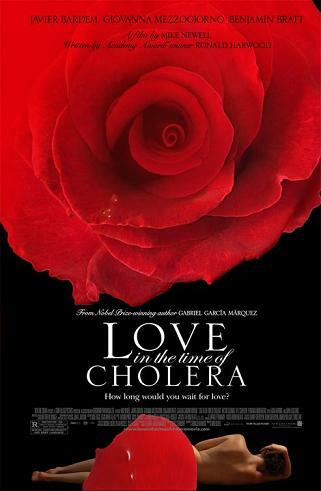 NYC MOVIE GURU: What’s so special about the book Love in the Time of Cholera by Gabriel García Márquez? MN: It’s rare that you would get a book that is so humane. Gabriel García Márquez has a colossal capacity to love and to understand. He understands these characters and has this chemistry experiment of a plot which pops up because of the reactive agents inside it. There’s a beautiful appreciation for who the people are and what their pressures are. You also see them going through sixty years of their lives, unlike in most novels or stories of any kind which happen in a few months or a few years. I love that because, recently, both of my parents have died and they had had a very long marriage which had been successful and not untroubled. I felt the urgent need to get that stuff out of me.